Hey there is the finished Blueberry Cheesecake. My Family loved it. Thank you so much. I am writting to tell you I love blueberries…..but I am “over the moon” about yours! I have NEVER tasted berries like these! Almost crips on the outside, PERFECTLY tart AND sweet at the same time! Thank you! I live in Newburyport, Massachussetss and buy them at my local Market Basket! I love your berries!! They literally are the best I’ve ever had in my life 100%. Thank you for giving me and my family such a delicious nutritious and safe berry to eat ?. Absolutely love this product! I have been back to Giant several times to buy more! Ther are like eating Candy! Thank you so much! These berries are THE BEST I’ve ever had in my life!!! And I´ve eaten a LOT of blueberries!! 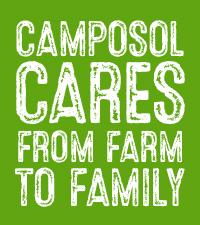 Thank you to all the ahard workers at Camposol in Peru making sure we get the best berries to eat in our homes!! Their yummy and delicious. The company cares for its workers. My husband brought some of your blueberries. They are so good I seriously need more! Amazing! I couldn’t stop eating them! They are fresh, delicious and just wonderful! The kids love them too!